The Red Sox traded outfielder Shane Victorino to the Angels in exchange for infielder Josh Rutledge and cash considerations. This is good news for Victorino, who just came off the DL and is going from a last-place team to a first-place squad, but Victorino still got emotional about his time with the Sox. 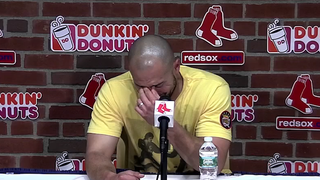 That’s a lot of tears for a guy who only spent just over two years in Boston, but I will also be pro-baseball dudes crying after trades. Shane Victorino seems like a good baseball dude.